Radek, Rekha and I have just returned from a weekend seminar in Heidelberg, Germany from a seminar given by Doshu Yoshigasaki. Thanks to the Heidelberg Ki AIkido club for hosting a great seminar and their hospitality this weekend. 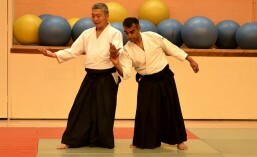 Doshu Yoshigasaki teaches seminars across Europe throughout the year.